Very Good. 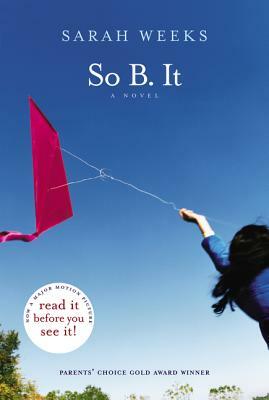 Heidi lives an unconventional lifestyle with her mentally disabled mother and their doting neighbor, Bernadette. A mysterious word in her mother's vocabulary leads Heidi on a cross-country journey in search of the secrets of her past. Trade paperback (US). Glued binding. 245 p. Intended for a juvenile audience. Very Good. So B. It (Booklist Editor's Choice. Books for Youth (Awards)) by Weeks, Sarah. Sewn binding. Cloth over boards. With dust jacket. 245 p. Intended for a juvenile audience. I am a participant in Big Brothers and Big Sisters. My Little Sister read So B It and raved and raved about it. She told me about it and wanted me to read it. The amazing thing about her, is that she is a little bit slow in some areas of school work. So when she could tell me so many details about the story I decided to read it. I purchased it, read it and then gave it to her. She was so thrilled. I am so glad it sparked an interest in reading in her.